Born in 1965, the world's second largest two-day rowing event takes place in Boston's Charles River. The tournament is estimated to host over 9,000 rowers, 1,750 boats, 56 races, and up to 300,000 spectators. It is usually held on the second to last weekend in October, from 7:45 am to 4:15 pm. Over 600 U.S. and international universities, rowing clubs, and institutions participate in this event, and dispatch their associates ranging from college alumni members to Olympic athletes. Drawn from a tradition in England, the winners of each race are given the honorary title, Head of the River, or in this case, Head of the Charles. Two-oared rowing, or sculling, is when a boat is propelled by one or more rowers that hold an oar in each hand, and row both sides of the boat at the same time. This is in contrast to one-oared rowing where a single oar is used, and is held by each rower using both hands. The boat, or shell, is classified according to how many rowers it can hold. A navigator, or coxswain, is usually present, who faces the rowers and communicates verbal instructions on steering, monitors the rate of speed, and encourages the crew. There are many different tournament categories including Youth, Collegiate, Masters, Mixed Doubles, Parent/Child Double, and even the new and popular Alumni Eights, where more senior folks can take up the oars and race again. All of these classes ensure that the playing field is always level. 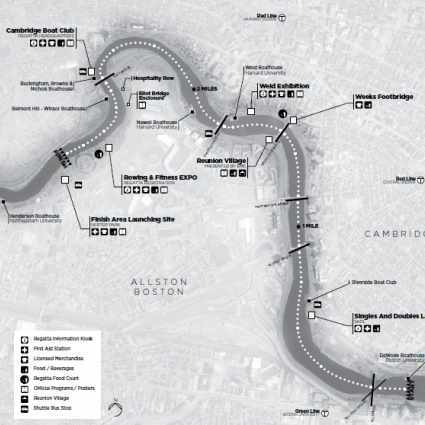 The course is a serpentine, 3.2-mile stretch of hard-to-maneuver, penalty-prone, sculler challenging section of the Charles River. It has 7 bridges, deceptively sharp corners, and more rowing shells crammed into a river in a weekend than in any other regatta in the world. 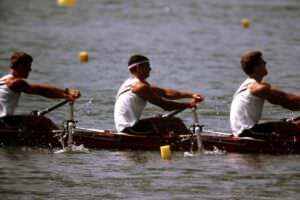 Between maintaining perfect form, speed and precision, rowers and the coxswain must continuously steer clear of other boats, commencing 15 seconds apart from the starting line. Bad weather can actually cancel this much-awaited event despite competitors from all over the world traveling and setting up shop here, if race officials decide that a rescue is not possible under inclement weather or river conditions. Of course, these are safety measures that are necessary for an event of this scale and magnitude. All across the course, many thousands of spectators line the river banks to witness the race first-hand. There is an official Reunion Village, where various alumni groups and sponsors set up tents and hold private social gatherings. Of course there are food and souvenir booths, and free giveaways from sponsors all along the river. The boathouses also usually hold open houses, and there are rowing and fitness expos held to attract the many spectators and rowing enthusiasts. Since 1998, the Head of the Charles Charity Program has generated more than $800,000 for very worthy causes. Its official charities include Access Sport America, Cambridge Community Foundation, and Community Rowing. The Charity Program allows competitors to immediately qualify for an event for a donation of $1,250 per person, per entry. Any 1, 2, 4 or 8-person team is eligible.